TXM and Best Practice Network have been collaborating over the past month to develop and refine a new Lego simulation workshop to teach the principles of the Lean Supply Chain. The simulation concept was developed by TXM Director, Tim McLean. Tim tapped in to the considerable coaching experience of Victorian Best Practice Network Faciliator Neil Hooke a small team of volunteers from Best Practice Network Members Toyota, Leica Biosystems, Denso and CSL Sequirus. 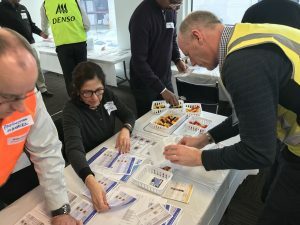 On 7 September an enthusiastic team of participants took part in the first full run of the simulation at a Best Practice Network event at Horizon Global in Dandenong. A further run is planned at Leica Biosystems in late September, before the simulation is taken to the US to be officially launched at the AME Boston 2017 Conference where Tim McLean and Kevin Bennett from Best Practice Network will run the simulation. The innovative simulation simulates an extended supply chain with a simple manufacturing process, a warehouse, local and overseas suppliers. Participants see the problems that occur in a normal forecast driven supply chain and then make improvements using lean supply chain thinking to improve performance. The one day workshop enables participants to understand first hand what is going wrong in their supply chain and the simulation is backed up with real case studies and coaching on supply chain principles.